Tokyo has unveiled its plans to build the Olympic Mountain Biking course on an island of reclaimed land in the middle of Tokyo Bay. Named the Sea Forest Mountain Bike Course it promises to be a lush green, albeit artificial, forest. An oasis in the city if you will. But in a twist of irony it has been revealed, actually we've known for a some time, that the island upon which the mountain biking event is to be held is currently inaccessible by bicycle. The reclaimed land is connected to its neighbouring islands via two tunnels and a bridge all of which are closed to bicycle traffic. Tokyo Gate Bridge which services the island opened with fanfare in 2012 and opening ceremonies included an organised cycling event which passed over the bridge. But as the bridge has no bicycle lanes, and a punishingly steep gradient it has since been closed to bicycle traffic. As it stands, with no subway access, the only way to reach the island is by car, but this will be addressed with the construction of foot bridges before the beginning of the games in 2020. Tokyo Gate Bridge. No Bicycles Allowed. 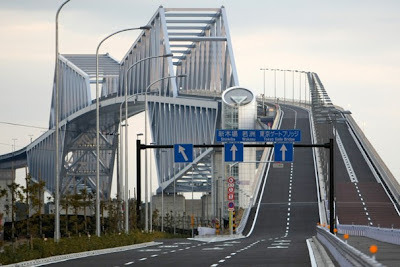 The entire Tokyo Bay area, where the majority of Olympic events are to be held, is decidedly difficult to access by bicycle as Tokyo Gate Bridge is closed to cyclists and cycling is not allowed on Rainbow Bridge, although you can walk your bicycle over. This makes the area very difficult to access by bicycle. One thing we're hoping is that transport planners will consider cycling when designing access to the Olympic venues and that the infrastructure they lay down for cyclists will continue to exist long after the games have finished. Given close proximity of Olympic venues providing a bicycle share system with parking stations at each venue, and a network of cycling lanes connecting the venues would allow spectators to quickly and easily move between events in a convenient and environmentally friendly way. Sadly the general public has very little say about the direction of development of the Olympic sites. No public hearings, very little public input. If you'd like to see world class cycling infrastructure in Tokyo for 2020 then join me in tweeting Tokyo Governor @inosenaoki to keep transport, and in particular cycling, forefront in his mind. Read more about venues for cycling at the 2020 Tokyo Olympics. All of Odaiba is easy to get to by bike via route 304 (Ginza -> Tsukiji -> Kachidoki -> Harumi -> Ariake -> Odaiba). But the island where the mountain biking course will be is an entirely different story. I think it is only accessible by car and I assume bus. Will be interesting to see how they plan to get everyone out there for the events. Visiting Odaiba by bicycle from the Ginza direction is easy, but there are other routes available to cars including Rainbow Bridge and Gate Bridge, that if open to bicycles would make access easier. I'm keen to learn Tokyo's plans for bicycles in the area during the Olympics. A bike sharing system in the area would be a great way to ferry spectators between venues, and the land is still largely empty which means space could be set aside for proper cycling infrastructure. Whatever they do, I hope they do it right. True, RB could be an additional option... just wanted to point out that there is an easy way to get to Odaiba by bike other than RB. I've never walked the RB so I don't know how wide the walkways are and if they could accommodate both pedestrians and cyclists at the same time safely. Unfortunately, I doubt that the "powers that be" will do much to accommodate cyclists for the Olympics. Hopefully I'm wrong. I am happy for Tokyo but no for me. The Shinkiba/Wakasu area is my favorite leisure cycling destination. I reckon it will be a giant construction pit for the next few years. Probably there will be not to much done for cyclists. The Olympics is an inconvenient reality of the development project. That is prime waterfront and I expect things will be managed with an eye to post Olympics business- a yacht basin, luxury condominiums and the such. I would not be surprised at all if the island where the MTB events are to be held will become Tokyo's casino island. Hardly welcome, but the country is starved for growth and casino are generally a quick fix and according to the press the idea is starting to gain momentum. Being a waterfront area makes it attractive for tourists and casual cyclists. If the area were to be developed with tourism in mind after the Olympics, then good bicycle infrastructure should be considered. As it stands shopping and tourist and shopping areas are spread out and separated by wide and ugly roads. Some infrastructure for cycling would make getting around Odaiba much easier. Yes, I agree. I am not sure if you know this, but the Sumida River terrace, a nice 10km or so that stretches from Senjyu to Tsukiji, bans bicycles! It is usually quite empty except for homeless and security guys who tell cyclists to hit the road, so to speak. I was shocked. I can cycle on crowded pavements, but not on the empty riverside. I suspect cyclists will not be particularly welcome on waterfront areas once developed. Although I agree it would be nice.